Pros: Fantastic performances from all, depicting the writer’s complex characters and telling a very intriguing story. Cons: Sound and words sometimes lost by the physicality and arrangement of the staging area. A frustratingly brilliant production showing the remains of a very complicated family. 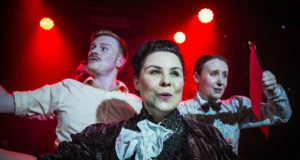 Ghostlight Theatre Group’s production of Family Values showed previews at The Space, and old church converted to a fantastic venue in east London, ahead of the Edinburgh Fringe this summer. 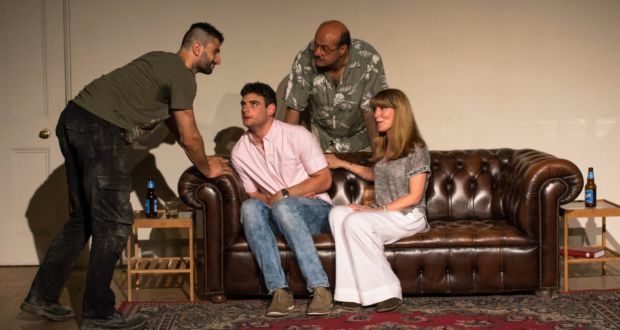 Written by Michael Dalberg and directed by David Gasperetti, Family Values depicts the complicated lives of two brothers accepting and attempting to move on from a very difficult past. Caught up in family rules and the constant need to look over their shoulders, Trent and Liam contemplate their actions and their consequences when two unexpected guests arrive at their house in the middle of the Florida Everglades in a dreadful storm. The guests’ presence and what they could learn makes everyone’s situation a lot more complicated. Ivan Comisso and Frederico Moro’s portrayals of the two brothers show their complex personalities and their unfortunate ties to the ‘family values.’ Aggression and playfulness seems to be the only way these two know how to interact. Their relationship spirals in and out of control until, unfortunately, we can see there is no way for these two brothers to escape what they’ve always known. Virginia Byron and Tino Orsini give us a fantastic stereotypical couple, May and Frank, that rock up on the front step of this already crumbling scenario. A couple that seem too good too be true and too rehearsed too be real make us constantly wonder if they are who they say they are, and how they’ll survive the meeting with these two men. I’ve always admired the versatility with The Space. The opening lighting and sound design set the performance up to the right standard. This time, the transformed church was a very small and simple living room to a very quiet house. 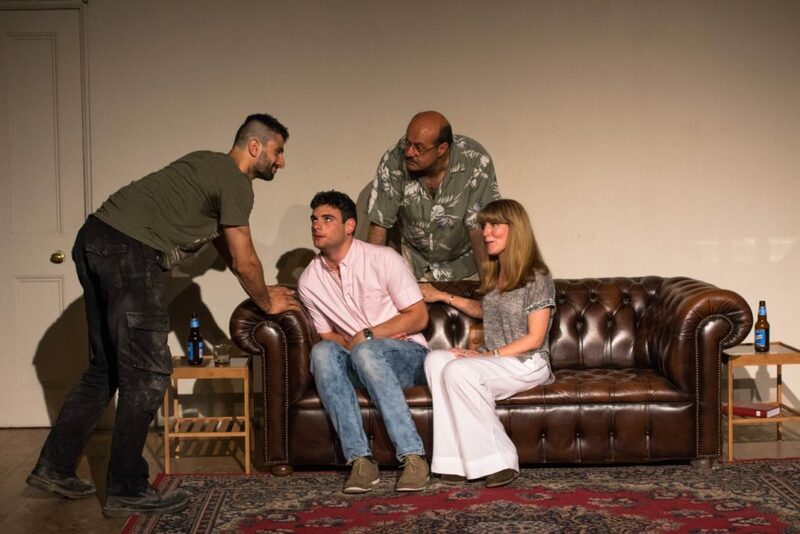 With only one sofa and a few suspect looking items scattered on the stage, the writing and performances were all the audience needed to be drawn into this world. Fast-paced, intriguing and mysterious, Michael Dalberg’s story is wonderfully illustrated by the four performers. With the arrangement of The Space, it is sometimes easy for the sound to be lost in the back and beyond. Unfortunately for the actors, this made connecting with the audience slightly more difficult, especially with a very physical performance like Family Values. At a humbling ‘pay what you think’ price, this story is intriguing and undeniably a brilliant watch from beginning. An almost frustrating ending gave me everything I needed to know and see. 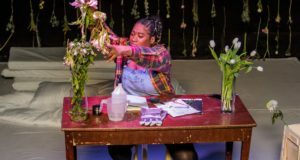 This production deserves big audiences every night on its run at The Fringe. If you are fortunate enough to be there this summer, I would recommend Family Values as a real brain teaser.